The 634-acre (256-hectare) Abraham Lake Nature Reserve in Halifax County, owned by the Nature Conservancy of Canada (NCC), is a provincially designated nature reserve under the Special Places Protection Act. 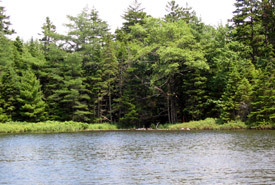 Located 25 kilometres east of Upper Musquodoboit, the site is managed jointly by NCC and the Department of Environment, Protected Areas and Wetlands Branch. The natural significance of the old-growth forest at Abraham Lake has been recognized for more than 40 years. It was also identified by the International Biological Program — Conservation of Terrestrial Biological Communities Committee in the early 1970s. The site was held by Scott Worldwide Inc. from 1971 until the land was donated to NCC for protection in 1995. NCC's Abraham Lake Nature Reserve features an outstanding example of old-growth red spruce forest. This forest type is now extremely rare in Nova Scotia. Individual trees in the reserve are more than 200 years old and 30 metres tall. Other species associated with the red spruce forest include yellow birch, Eastern hemlock and white pine. A diverse community of plants and wildlife have been seen within the reserve. The forest stands are located in an area of rolling hills. Other tree species that have grown here include sugar maple and American beech. Staff from NCC and the provincial Departments of Environment and Natural Resources, along with volunteer experts, conducted a bioblitz in what is known as one of the oldest red spruce forests in Nova Scotia. The research focused on documenting and describing the variety of species and ecosystems found in this old-growth forest. Experts searched out and identified plants, mosses, lichens and birds. Staff from the Department of Natural Resources worked to characterize the various forest types found in the reserve. “The data collected was compiled into a Baseline Inventory Report, which is a reference for understanding the ecology and biology of the site,” said Craig Smith, NCC program manager in Nova Scotia. NCC has developed a management plan that considers the ecological values of the reserve, and any activities or factors that may threaten those values. The management plan outlines stewardship strategies and priorities that guide and define future activities undertaken in the area.